Morecambe manager Jim Bentley wants his players to be more streetwise following their FA Cup struggles last weekend. 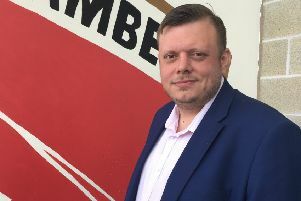 A below-par Shrimps team stuttered to a goalless draw against National League side FC Halifax Town at the Globe Arena in the competition’s first round. It could have been worse for Bentley’s squad but for a questionable offside decision which ruled out Jonathan Edwards’ injury-time header, which looked to have given the Shaymen the lead. That move had stemmed from a corner at the other end from which Morecambe had surrendered possession and then allowed their visitors to break. “Zak Mills had committed himself for the header and then it’s a three against one situation in a game we didn’t deserve to lose,” Bentley reflected. “We might not have done enough to win the game but it goes down the other end, the pass sends their player wide and then, when it comes back in, for me their player is level. “But, we’ve had loads of situations this season where I’ve said we need that bit of luck and we’ve had that. Halifax’s excellent defensive work meant the Shrimps struggled to assert themselves going forward. Passes went astray on a regular basis, the final ball was not what it should have been and wrong options were taken in the final third. Nowhere was that more obvious than those situations when the visitors were reduced to 10 men. On more than one occasion, Nathan Clarke had to leave the field for treatment to a facial injury and left his players with a task on their hands; one which they more than accomplished. However, Bentley’s players were unable to capitalise on that advantage. “We didn’t a have a cup atmosphere or mentality but it doesn’t work like that,” the manager said ahead of the Shrimps’ Checkatrade Trophy home tie with Sunderland on Tuesday evening. “You have to show a bit more desire and, when Nathan Clarke goes off injured, you have to get on the ball, play it quickly as you can, express yourself and make that numerical advantage pay. “I’m disappointed with some aspects of our play; a clean sheet was massive but four or five players were off it and I’ve told them that. “I’m disappointed in that respect and now we have go away from home for a replay as the games are coming thick and fast.